Now this serves as both an FYC and a tribute to one of the best television had to offer in years. Whimsical, exciting, colorful, romantic, gripping, funny, sweet, dramatic… no other television series can be called all these words in the same breath but ABC’s Pushing Daisies. Though last Saturday’s airing officially (and sadly) made the title literal once and for all, the now freshly-late and very great series provided two seasons and 26 episodes of amazing television. Never has one hour of television made the topic of death so… fun. Whimsical and death aren’t usually words found in the same sentence, but Pushing Daisies made it happen. The series centers on Ned, a humble pie maker with a special power: he can bring the dead back to life. But there’s a catch. He can bring the dead back to life for one minute, otherwise someone or something else must die in its place. Not only that, but once he’s touched them once, the 2nd time, dead for good. He doesn’t know where this power came from, and discovers it quite tragically (his mother, the first recipient of the touch). As an adult, he meets private eye Emerson Cod. Together, they, quite easily, solve crimes (usually deaths and unsolvable murders) with Ned and Emerson using that one minute of back to life to ask the victims who dun it. But it all comes full circle when Ned brings his childhood friend and crush, Charlotte “Chuck” Charles back to life after being murdered on a cruise. From then on, their romance blooms, with Ned’s friend, faithful employee and secret admirer Olive Snook looking on with longing. Add to this cast of characters, Chuck’s two aunts Lily and Vivian (the latter revealed to be her real mother), Ned’s dog Digby (also brought back to life), and our trusted narrator (voiced perfectly by Jim Dale), and you’re ready to bring one amazing story to life. An excellent ensemble, one of the best on television. One part crime solving procedural, one part romantic comedy, a pinch of soapy drama, throw in a few (excellent!) musical interludes and you’ve got the recipe for one of the most delicious television shows ever. Keeps you guessing murder mystery every week? Check. Television’s best coroner ever? Check. A nunnery atop the mountains? With Sound of Music AND Vertigo references? Check and check. One of the best soundtracks on television? Check. One of the most awesome TV dogs ever? Check. Makes death fun?!? Double check. The series ended too soon. The writers strike broke its momentum, its almost ten month hiatus didn’t help its relaunch, and ABC couldn’t do anything but cancel it. But for two seasons, Pushing Daisies has delivered. Always exciting, always fun; it was just an absolute joy to watch. Rarely does a television series leave you feeling warm and fuzzy inside and not feel guilty about it. You can’t help but feel good after watching an episode. It was different. It gave audiences a unique experience. An incredible world, almost fairy tale-like, yet still tangible. Some place one might actually want to go to. Escape. 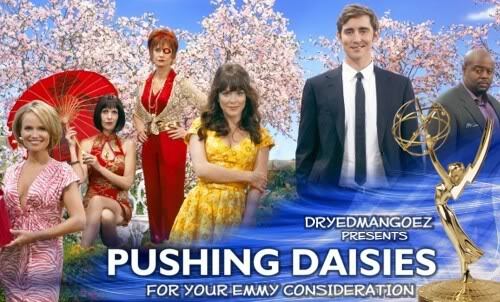 Pushing Daisies, simply one of the very best on television.